When you live in a desert, “dry heat” isn’t just something you deal with now and then, it’s a way of life. In Phoenix, Arizona, residents look forward every day to chapped and cracked lips, dust on everything, the constant glare of the sun, and then a temperature that drops like a stone as soon as the sun sets. It’s no wonder, then, that so many local homeowners look to No Limit Pools and Spas to build them some of the best swimming pools in Phoenix. When people think of backyard pools, they usually think of the standard shapes and sizes like circular pools four feet deep, ovals that dip down at one end, or long rectangles with lane markers and a diving board. But while you can add any of these pools to your backyard, you don’t have to stick with the conventional when it comes to No Limit’s swimming pools for Phoenix. A swimming pool is an addition to your backyard, so it should reflect what you want your backyard to be. If all you want to do with a pool is to lounge in the water, we can create a small, shallow pool or else a lounging area that conforms to your body’s shape and lets you relax without worrying about sinking underwater. If you want a pool for the exercise, we can make one that’s long and thin for laps or install powerful swim jets along one side. If you have a big family or throw big parties, we can make a big pool just three feet deep that’s perfect for playing around. If there’s one thing that stops most people from installing a pool or buying a home with a pool, it’s all the upkeep and maintenance that come with keeping a pool in top condition. But when you buy a pool today or when you choose to remodel an older pool, you can take advantage of all the pool automation technology that has come a long way in the past ten years alone. Balancing pool chemistry can become a breeze when you add a chemical dispenser, also known as a feeder. Not only does it constantly check the pH balance and chlorine levels, it can also release the needed chemicals into the pool so that it always has a perfect balance. In fact, modern models can contact your smartphone so you can order more chemicals as the dispenser runs out. These dispensers can also work for salt water chlorination systems. You can also keep the pool clean with a robotic cleaner, and you can keep swimming in the cold desert nights by installing an efficient pool heater that runs on solar power. Life has never been easier for owners of swimming pools in Phoenix. Digging up an in-ground swimming pool uses a lot of heavy equipment, equipment that tears up turf and needs a lot of open spaces to move through. Putting your front and back yards back the way they were is all part of the price, of course, but many of our clients take the opportunity to reimagine their backyards from the sod up. The patios that surround swimming pools in Phoenix and throughout the country can be plain concrete blocks, but you can upgrade them to stamped and colored patterns or use other materials like stone tiles. 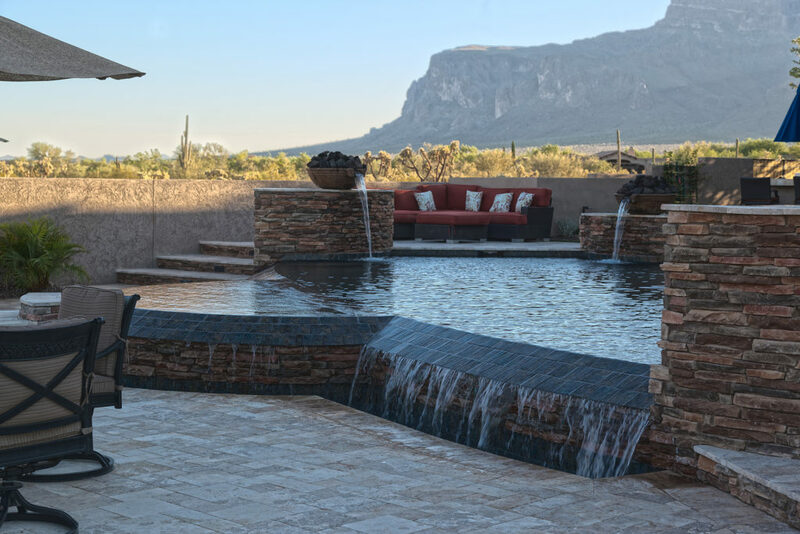 We can add rock formations, waterfalls, and fountains to decorate your pool, and we can add gardens full of hearty plants that can thrive in the Arizona desert. Covered patios can add some much-needed shade to your yard, and with the right equipment, you can turn your backyard grill into a full outdoor kitchen. At No Limit, we can help you turn your yard into a paradise just a few steps away from your home. When you live in Phoenix, a cool swimming pool is always a good idea for how to spend a hot afternoon. Whether you want to exercise, have fun, relax, or just have an opportunity to cool off, you can do it all in the backyard swimming pools of Phoenix. So if you decide that the time has come to add a pool or remodel the pool you already own, make sure you contact No Limit Pools and Spas to learn how we can build you the perfect backyard.